The Dutch Payments Association is a small and efficient organisation committed to easing the burden on its members. The Association has an associative structure. Membership of the Association is open to all providers in the end market payment system. Board: The Board makes substantive decisions on important issues, establishes policy frameworks and advises the Executive Board. The Board consists of nine people, with representatives from the supply side (appointed from the members of the Payments Association) and three independent Board Members, including the chairman. The Board’s primary tasks include determining the strategy, establishing policy frameworks, appointing and dismissing the members of the Executive Board, approving the annual plan and the budget and monitoring performance quality. Click here for more information on the Board. Executive Board: The Board appoints the members of the Executive Board, which is responsible for the operational organisation. 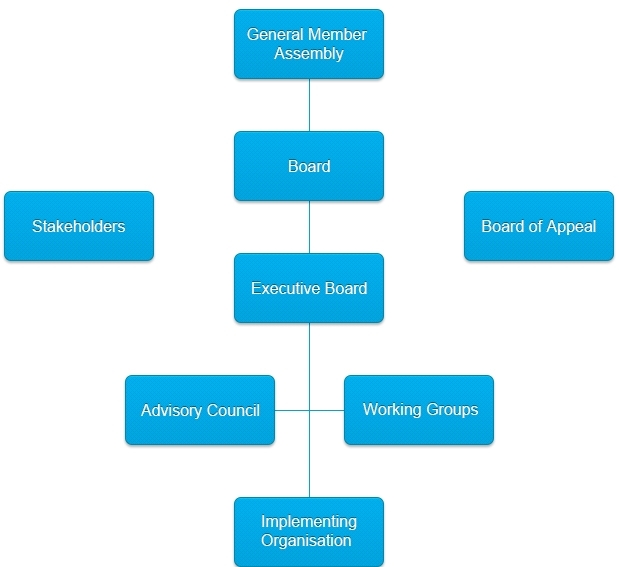 The Executive Board’s tasks include formulating policy proposals, carrying out the day-to-day operational activities, deciding on the acceptance of new members, the certification policy and monitoring compliance with the rules. Advisory Council: The Advisory Council advises the Executive Board – both on request and on its own initiative – on the policy and the activities of the Payments Association. An independent Board of Appeal makes it possible to appeal against decisions on acceptance and certification when parties are unable to reach agreement with the Executive Board, the Board and finally with the Appeals Committee of the Board.